When bills are piling up and necessities need to be purchased quickly, you don’t have the luxury to wait a whole week or more for your bank to cash in your cheque. Allow CashCity to deposit your cheque and get cash in your hands within minutes – no waiting, no hassles, and no headaches. No matter the type of cheque you have – payroll cheques, government, tax, or insurance cheques, business cheques, or post-dated cheques – we’ll get your cash quickly with no hassle and no long holding periods. Plus, we offer the lowest rates in the industry, starting from just 1.99%! Come in today to our convenient Etobicoke location to cash in your cheque and get your money fast. Why do check cashing at Cash City? Step into our Etobicoke location today and cash your cheques instantly. Are my funds held for any period of time? Not at all. At CashCity, you receive your money instantly, within minutes of cashing in your cheque with us. What kind of identification do I need to have? It’s simple: as along as you have two pieces of valid ID, one of which is a government-issued photo ID showing that you are over the age of 18, consider the cash yours! For a business cheque, please include a business license/registration or articles of incorporation. CashCity accepts just about any kind of cheque, whether it is personal, payroll, business, or post-dated, along with most other cheque types. Due to compliance with safety measures, payroll cheques from non-established companies, or hand-written cheques from individuals cannot be cashed unless certified. If you have a specific question regarding your cheque, just give us a call or come in to our central Etobicoke location today. What is the advantage of cashing in my cheque with CashCity? With CashCity, there is no holding period, no long paperwork, no need to wait for your cheque to clear, and instant cash in your hands right when you need it, discreetly and securely. 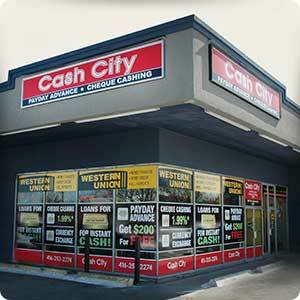 With the lowest rates in the industry – starting at just 1.99% – you can’t go wrong with CashCity. Better yet, we are open for extended hours to serve your needs throughout the day. Simply come by our Etobicoke location and present your cheque along with two valid government-issued IDs (at least one with photo). Your cheque will be cashed on the spot, and you’ll have your money in no time, convenient and hassle-free.